€ 7,50 per person (including program booklet). On Sunday September 8th 2019, you can buy a ticket at one of the checkout points around Lichtenvoorde. Children and young adults up to 16 years are free of charge. Grandstand tickets are available in presale (until Tuesday August 27th 2019) via this website. There are grandstand tickets for the five stands on the Varsseveldseweg and the Richterslaan. Grandstand tickets only give you the right for a place on one of the stands, entrance is not included. Until Saturday September 7th you can also buy tickets at the Tourist Office in Lichtenvoorde (address: Markt 11a). On Sunday September 8th grandstand tickets are available – when in stock – at the stands. The seats are not numbered. Upon arrival, you will be allocated a place. The first row of each stand is reserved for disabled people. Coming from the direction Bocholt-Aalten go straight over the roundabout, take the second roundabout on the left Vragenderweg, follow signs. Coming from the direction of Enschede-Groenlo, head towards Lichtenvoorde. Take the exit on the left to Aalten-Bocholt, at the roundabout turn right, follow signs on the Vragenderweg. In the immediate vicinity of the Flower parade, several parking spaces are furnished. The length of the route of the Flower parade is 2.5 km. On the above map, the route of the parade is highlighted in green. You will also find an overview of the stands (stands A-De Klinke & B-Antoniushove are at Varsseveldseweg; stand C-Richterslaan is at Richterslaan). 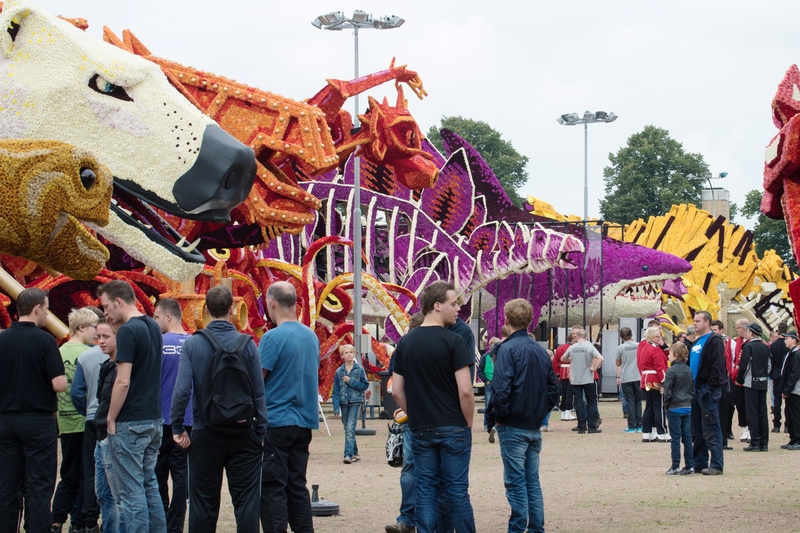 At the end of the Flower parade - about 4.30 pm- the floats are lined op at the exhibition grounds situated at the ‘Gert Reindersstraat’. This area is beautifully illuminated at night. The exhibition area is open to the public from 16:30 to approximately 23:00. 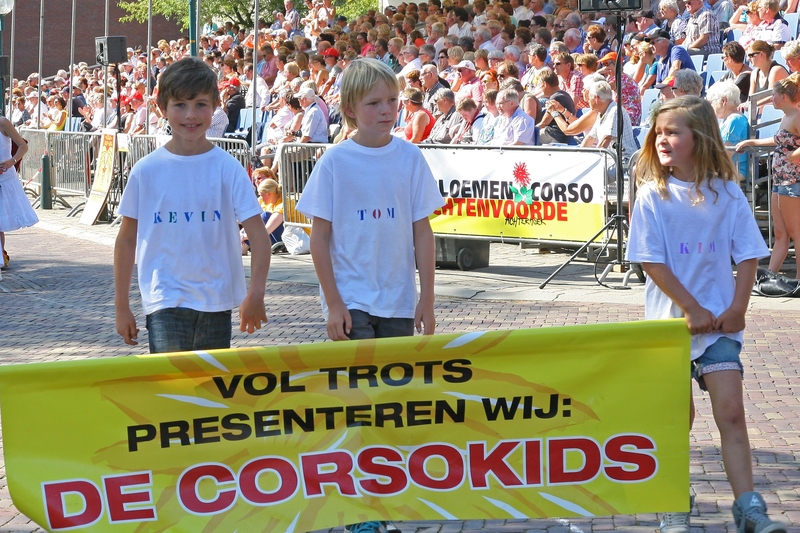 In the program booklet ‘Corso in Zicht’ you will find a map of the parade route. The exhibition area is also mentioned on the map. The main entrance of the exhibition area is situated at the Hendrik Leemreizestraat. On Monday morning, after the awards ceremony, the parade will follow the same route as it did on Sunday. On Monday the exhibition area is opened form 12.00 am till 22.00 pm. A ticket for the exhibition area costs € 2.50 per person and is valid on the day of issue. Entrance is free for children and young adults up to 16 years. Tickets are only available at the box office at the exhibition area. Sunday 8th September, from 16:30 pm - 23.00 pm. Monday 9th September, from 12:00 pm - 22:00 pm.